1. Timi Dakolo: Undoubtedly one of the night’s big winners. The guy combines lyrical genius with a gripping voice. His rendition of Cry at the beginning of the show was an elixir which calmed an audience restless over the event’s late start. His second appearance, in which he performed Great Nation was a fitting way to conclude the event, especially as it was capped with the video premier of that song. By the way we recommend Timi’s Great Nation video. Winner. 2. Denrele: The eccentric Channel O VJ was at his best. Nowadays, his dressing doesn’t quite cause the stir it used to, so he’s lucky he’s got the talent and showmanship needed to still shine. His performance with Muma Gee was brilliant and even looked rehearsed. But his moment of glory came when he took the On-Air-Personality (TV) Award despite being nominated five times in a row with no luck. His acceptance speech was one of the night’s highlights, thanking God for not allowing his “breast to fall”, revealing that he prayed in his bathroom for 20 minutes before the event to emerge victorious and advertising his “market” to the Rivers deputy governor. The audience loved him and he got the loudest applause on the night. Winner. 3. Muma Gee: Muma Gee’s performance on the night was unforgettable, but not necessarily for the best reasons. She tried too hard to impress, it began to look embarrassingly funny. She praise sang for the Rivers State government to a fault, spent an inordinate amount of time on stage, obstructed her performance with unnecessary talk breaks more than ten times, and was supported by a dreadful crew of backup singers. Luckily, she had a saviour in Denrele, whose crazy dance moves when she smartly invited him on stage helped redeem what might have turned into a disaster. Loser and … Winner. 4. Government of Rivers State: Apart from being great hosts of the event, the decision of the government to take nominees on a tour of projects completed by them was an inspired one. Every single person in the touring party was impressed – not one exception. And that’s saying a lot, considering that some of the most critical young minds in this country were on that tour. The world class schools, health centres, power plant and the farms were impressive, to say the least. The easy airs of the government officials (though stage-managed of course) were disarming. Now the participants will tell their friends, they will blog about it and they’ll post pictures, all of which is great news for the Rivers State government. Winner. 5. Idris Akinbajo: Congrats to Idris Akinbajo, the man who won the top prize on the night – The Young Person of the Year Award. Anyone who’s able to fend off strong competition from the likes of Psquare, Jason Njoku, D’banj and Linda Ikeji, must be something. Akinbajo, a journalist with Premium Times has won multiple awards including African Investigative Journalist of the Year, Nigerian Investigative Journalist of the Year, Best Nigerian investigative story in print, and second best Nigerian investigative story (online). 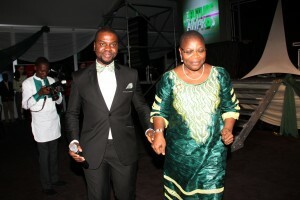 He was also a finalist for the CNN/Multichoice African Journalist Awards 2012. Winner. 6.The Future Project: The organisers of The Future Awards did a great job once again, in packaging a show worthy of the hype. They also did an appreciable in handling the logistical challenges involved in taking the event away from its traditional centre, Lagos. But there were some issues, like the late start to both the symposium headlined by Mr. Tony O. Elumelu, and the event proper. They’ll have to do better than that because it cannot be said that the future also subscribes to the concept of “African man time.” That didn’t take away the shine off the event though, and the organisers are sure winners. 7. The Atrium: This event venue where the keynote address was given just wasn’t big enough, or good enough, to host the Awards show. So the awards happened at a better venue, Aztech Arcum. For missing a chance to host Africa’s biggest youth event which has been described as the “Noble Prize for African Youth”, the Atrium is a … Loser.